Whether you are interested in investment advice, planning for retirement, life insurance, estate planning, or if you have a 401K to rollover, Ray and members of his practice stand ready to help you. The financial world can be intimidating; let us help you meet your goals. We encourage you to explore our site and learn more about the services we provide. 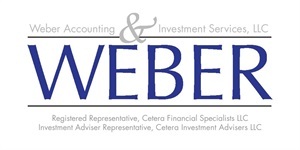 Should you have any questions or need more information on our firm, please email us at raymond.weber@ceterafs.com or call (815) 223-5606.